Yesterday Mrs V and I went shopping, as we do most Sundays in preparation for the week ahead. Usually we go to our nearest supermarket, a branch of Giant. However, the past couple of Sundays we have gone elsewhere, yesterday we went to a local Harris Teeter and last week it was Walmart in Zion Crossroads, which actually far nicer than many a Walmart and if you go early on a Sunday it is delightfully peaceful and lacking in "people of Walmart". Whenever I go to the supermarket, I instinctively head for the beer aisle, just to see what there is, if there is anything new and if there are any seasonals that might be worth picking up. Just a minor aside, I wish more places had the option of making your own 6 pack, it took me ages to get rid of the 6 pack of the god awful Sam Adams Noble Pils a couple of years back. Anyway, pretty much every supermarket I go to in our area has a reasonable selection of beer. Our local Giant has various Sierra Nevada, New Belgium and Sam Adams offerings, local brews from Starr Hill and Blue Mountain Brewery and a few other bits of pieces from wider Mid-Atlantic region and further afield. The Harris Teeter has a pretty good selection of non-US beers, including Fuller's Vintage 2011 and the full range of Chimay in big bottles. They also have a good range of US brews, including stuff from Flying Dog, Heavy Seas and North Coast. While Walmart has fewer small to mid size brewery products, it was there that I picked up a Heavy Seas mixed 12 pack in preparation for the end of my beer fast. As you can imagine, I very much enjoy this easy access to decent beer, and in the case of Sam Adams and Sierra Nevada, decent beer in bottles I can re-use in my homebrewing. However, this ease of access got me thinking the other day, a dangerous thing for sure, about how accepted "craft" beer (for want of a better phrase) is within the mainstream. Now, of course it is easy to get all cynical and say that the supermarkets are jumping on the bandwagon in order to sell products (which is actually the point of shops if you think about it), but I prefer to see it in a positive light, the market has recognised a demand from its customers for a better selection of beer, and like good businessmen every where they have responded. Sure, decent beer might not be the Thames of the beer world yet, but I would suggest that it is very much the Kennet or the Fleet - a tributary flowing into the mainstream. Living in Prague, there were many times when I could be found propping up one of the bars at Pivovarský klub. Often the choice depended on who was working in which bar, and if there was any space at that particular bar. Usually the main reason for my being in PK was to meet with friends, though of course the beer was also important - I could have met my friends in any of Prague's wonderful watering holes, but it was PK I preferred above all others. PK was also where I did most of my drinking with Evan Rail, author of CAMRA's Good Beer Guide to Prague and the Czech Republic and all round top notch person. To say I miss sitting in PK with Evan would be like saying a fish misses the sea once it has been caught. 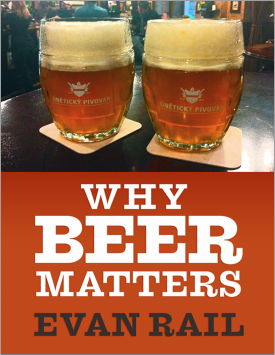 Yesterday, Evan emailed me a copy of his new booklet, "Why Beer Matters", which is available through Amazon's Kindle Store, so when I got home from work I sat down with it and had a read. The booklet only takes about half an hour to read, though I imagine I will dip in and out of it often. One of the central themes of Evan's thesis is that beer matters because of it's essential egalitarian nature, that it is a drink enjoyed by the haughty as much as the hoi polloi. I am not going to go into a thorough review here, other to say that at many points while reading, I was nodding my head, mumbling agreement and generally wishing we'd been having this discussion sat in PK. What I will say though, is that if you love beer and the beer world, click on the link and buy the book, it is worth every penny. I have a gripe with Sierra Nevada, and no it is not because they choose to set up shop in Henderson County, North Carolina rather than in Virginia - Mrs V's uncle lives in Henderson County, so we have even more reason to go visit. My gripe is simply this, they ditched Glissade. Glissade used to be their spring seasonal, a 6.4% bock which would sit in the glass and glow, it was such a rich beautiful golden colour. It was hopped with Magnum, Perle and Spalt, as well as Styrian Aurora. It was smooth, clean, crisp and delicious, everything you could possibly want from a strong pale lager. I wanted it, and I enjoyed lots of it, and in some strange way it gave me hope that my lager lust would be satiated. Obviously I am not party to the business decisions behind the ditching of Glissade, I have my suspicions but that could just be my cynicism coming through, but I do know that I am not alone in mourning the passing of this most moreish of golden drops. 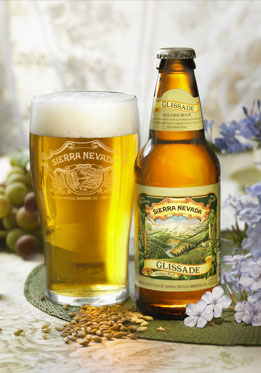 At work yesterday we were talking about Sierra Nevada for some reason that escapes me, I made a comment about Glissade and one of my colleagues mentioned that her boyfriend was as gutted by its demise as I am. I guess that from my perspective, and I say this as someone that has never not enjoyed a Sierra Nevada beer, the shame is that they do lager so well. Summerfest is required drinking as far as I am concerned, especially on draft. When Beer Run did a tap takeover with them, the highlights were a Vienna Lager and a Schwarzbier, yes Sierra Nevada do lager with aplomb. I haven't tried the usurper yet, Ruthless Rye IPA, but I will endeavour not to let my devotion to the former king of spring get in the way when I am back to drinking next week. One thing though I do hope for is that the Henderson County location will be more than just a production brewery. I would love to see a similar taproom and restaurant setup as they have in Chico, with a full complement of specialty drafts. * I wonder who can tell me the reference in the title? ** I take no credit whatsoever for the picture, that's from Sierra Nevada's website. The decision was taken on a whim, the cellar was sitting at about 55º and I thought to myself "what the heck, let's just give it a whirl". Some mild indecision followed, I knew the hops had to be Saaz, the base malt Bohemian Pilsner, but should I brew a pale or a dark beer? Dark beers tend to be more forgiving and so I took the plunge and brewed my first lager, a tmavé. From that little collection of grains I got a starting gravity of 1.058, about 14.5º Plato, putting the beer firmly in the realms of a "Speciální Ležák". Into the wort I chucked in 25 IBUs worth of Saaz hops and then had a mild panic. I had a packet of Saflager S-23 yeast that I was planning to use, but a few online conversations later I decided to change tack and head off to Fifth Season to check out their lager yeast range. A range, that day, of 2, one of which was Wyeast's Staro Prague yeast, sourced from Staropramen back in Smíchov. With the yeast suitably pitched I went about the rest of my day, and when night came the temperature in the cellar plummeted to 35º and in the carboy, no life stirred. In an attempt to insulate the carboy from the chill of the cellar, I wrapped a old lambswool sweater around it, and yet the carboy remained still. I read forums, realised I had pitched too little yeast and hoped that everything would sort itself out, while in the carboy the dark liquid sat. A day passed and on the advice of Kristen England, and to be fair Mrs V, I bought the carboy in from the cellar and sat it next to the double doors that lead to our "patio". There it remained, at 54º, for a couple of days. By last Thursday I was ready to make a starter with the Saflager S-23 and repitch. Getting ready for work that morning, listening to the BBC World Service, seeing to our dog and getting my breakfast, I had put my dark problem to the back of my mind. It was only when I went to get my coat that I noticed the tiniest smudge of foam in the carboy. Was it an illusion, a trick of the light, a mirage, the fevered imaginings of a homebrewer so keen to have his first lager not be a wild flop? Sure enough, on closer inspection, it was the merest hint of the beginning of life, and a bubble forced its way from the blowoff tube. I went to work with hope renewed. 8 hours later my hope was assured, as krausen sat on top of the wort and the blowoff bubbled regularly, and the temperature was 56º, just outside the optimal range of 45º to 55º for the Staro Prague yeast but nothing I am planning to worry about. As I say, dark beers tend to be more forgiving. This morning the krausen has sunk back and the bubbles are fewer. I will let it sit for another few days before I move it outside again to start the gradual lowering of temperature before preparing my lagering tank in the back of our fridge. The beer will sit there for 45 days, for no reason other than that's what I want to do, if I were to be really traditional it would sit there for 14 weeks, 1 for each degree of Plato. Originally I was going to call the beer Marzenna, in honour of the Morana tmavé from Devils Backbone, Marzenna being a variant name of the goddess Morana. 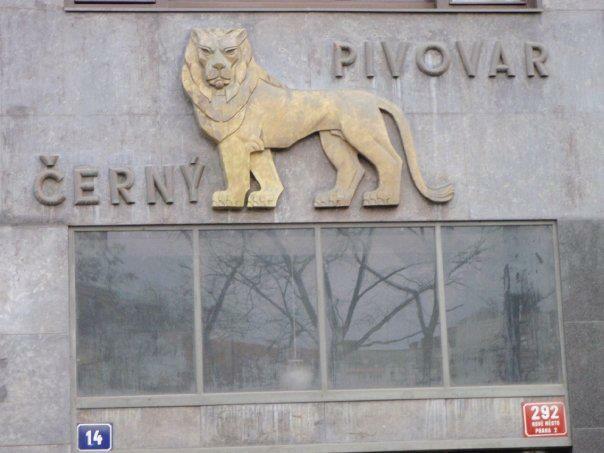 I changed my mind though as I was looking through some pitures of Prague and was reminded of the old brewery on Karlovo náměstí, just a few steps from where Mrs V and I tied the knot, and so the beer became Černý Lev, or Black Lion. On Monday I posted about the lovely beers from the Durham Brewery that I had over the Christmas holiday. Sadly that post lacked the pictures of their fine beer in their wonder snifter style glass. One of the attractions of the Durham Brewery is that they do interesting beer taken from history, and while the world seems to have gone loopy for East India Porter, under the guise of "Black IPA", Durham have dipped into brewing history to recreate the pale stout. So without further ado, I give you the man that brews these gorgeous drops of ale! How did you get into brewing as a career? Instrumental teaching job was disappearing and we had to find something to do. Microbreweries were new and I knew about beer. It was the obvious choice. What is the most important characteristic of a brewer? In a large brewery only the ability to push buttons. 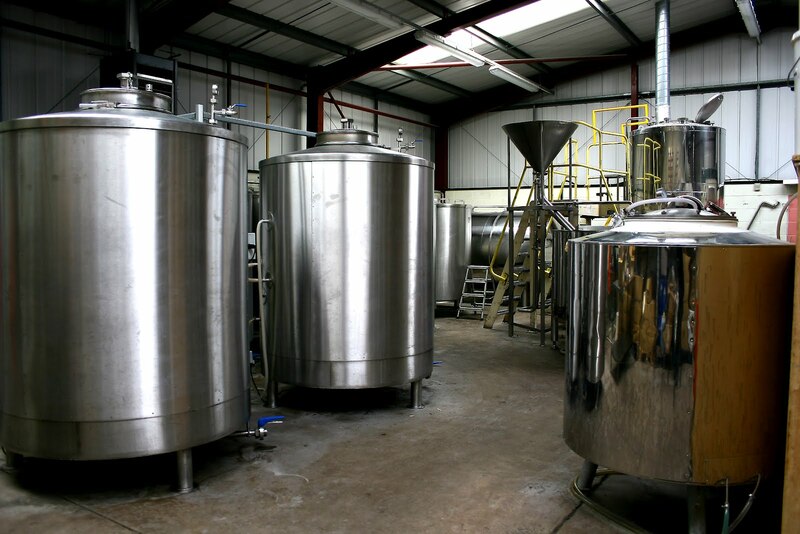 A micro brewer must understand all aspects of the process and have an open mind to be able to innovate and experiment. Before being a professional brewer, did you homebrew? If so, how many of your homebrew recipes have you converted to full scale production? Yes, I made beer as far back as my teens. When I started The Durham Brewery I developed a couple of recipes on the homebrew kit. Neither is brewed now but one, Celtic, was very successful. If you did homebrew, do you still? What is your favourite beer to brew? Most beers are very similar and run like clockwork but the beer most difficult is Temptation. Loads of malt to dig out and at the start of fermentation it gets out and walks around the floor, entailing lots of cleaning up and fine temperature control. If you have worked in other breweries, which other beer did you enjoy brewing, and why? Never worked in any other brewery. Of the beers you brew, which is your favourite to drink? Difficult to say. In cask I prefer traditional malty so Viennese Maltz and Evensong are favoured. In the bottle I prefer complexity so Temptation and Bede's Chalice are tops here. I have a feeling that the new Pale Stout will be a favourite. How important is authenticity when making a new beer, in terms of flavour, ingredients and method? Define authenticity! Most beers are Durhamised. Bombay 106 is an original recipe as is Temptation, but they are not absolutely authentic, nor can they be. 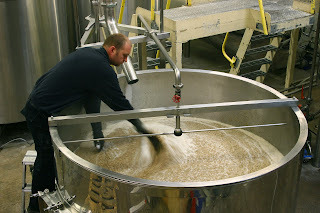 Make an IPA or Russian Stout in modern conditions and they will have modern characteristics. It is impossible to get the original ingredients. Also, modern palates would most likely not take to properly authentic flavours. All we can do is get close to the original beers while being as authentic as possible. If you were to do a collaborative beer, which brewery would you most like to work with and why? Hofstetten. Because the owner is a friend and open to new ideas. I would learn much from him. 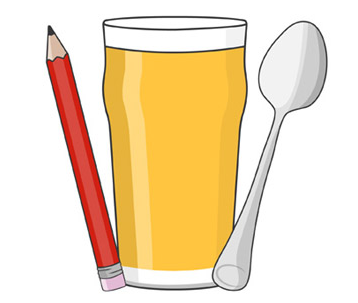 Which beer, other than your own, do you wish you had invented? It's that time of year. The days are noticeably longer now and I am past the half way mark in my annual alcohol and carb fast, which has so far yielded a weight loss of more than 10 pounds - so long holiday bloat! It also means that it is time to announce the plans for this year's International Homebrew Project. The first three options are pretty self explanatory, the fourth is a catch all for the several weird and wonderful recipes Kristen has floating about. For this year's project we are planning to brew a genuine 19th century recipe from a Scottish brewery, the exact recipe to be revealed when the poll closes. I am going to leave the poll up until January 31st with the intention of publishing the recipe on February 3rd. The eagle eyed among you will notice that I have added a page up in the top navigation, IHP 2012. The proposed schedule for the project is on that page, and I am leaving the comment option on so that you can let me know that you intend to participate. Last year we had brewers from the US, UK, Ireland and Latvia take part, so I'd love to see more people joining us this year. When I was trying to decide which online beer shop to buy my Christmas selection from way back in the entirely too warm depths of November, I had 2 absolute must requirements. Firstly, said shop had to sell Timothy Taylor Landlord and secondly have a selection of beers from the Durham Brewery. Only Beer Ritz satisfied these needs and so they got my cash. The first, and previously only, experience of Durham Brewery was back in 2008 when I had a bottle of Benedictus, an 8.4% barley wine which I really enjoyed and wished I had bought more of. This time I bought a 2 bottles of three of their beers, more Benedictus, Temptation and Bombay 106. I am not really much of one for the American versions of India Pale Ale, I find many of them to be like sucking lemons, but British style IPA is something I quite often enjoy, regardless of where they are made. Bombay 106, named for a British light infantry regiment, is a healthy 7% abv and hopped with masses of Goldings according to the advertising blurb. The Goldings are very much the star of the show here, big, hefty dollops of spice and a citrus note like Seville oranges. Backed with a firm malty body which means the hops don't run away with it all. The finish is long and dry with just a hint of sherbet in there for fun. Benedictus was largely as I remembered it, and remember it is how it will have to remain as it has been discontinued by the brewery. A beautiful copper colour, with a thin white head, the nose is a full frontal attack of toffee, canned fruit and citrus peel, and a boozy note chucked in. The sweet caramel taste dominates the drinking, though there is enough of a hop bite to stop it from furring the arteries. The highlight though on the drinking front was Temptation, their Imperial Stout which smashes through the doors with a big hitting 10% abv. This stuff looks like crude oil, black, inky, more than opaque it sits in the glass like a liquid black hole. The huge body it a riot of sweet malt flavours, caramel, toffee, chocolate all playing against a noticeable coffee note and the spiciness of the hops. Sitting watching the TV and sipping this was the perfect way to end the day, having had one of my mother's home cooked meals. Perfection. I think it is fair to say that whenever I head to the UK, I will be on the look out for more of the Durham Brewery's range, in particular their new historic beer, White Stout. Ah, Prague, city of a thousand spires, the golden city, the place I still think of as being "home" (in some loose, woolly sense of course). A city of writers, thinkers and drinkers, Kafka, Havel and Hrabal. A city with pubs on most street corners and some in between corners in case you need refreshment from one corner to the next. Enough with the misty eyed reminiscences, this week's guest blogger is often known as Max, though perhaps more often known as Pivní Filosof. I have shared many a pint with Max, not to mention beer spirits at festivals in Plzeň, so it is my pleasure to hand Fuggled over to him for a few hundred words. Other than the pub in the village I lived at the time (a great place where we had our wedding reception and we still visit every year on that day's anniversary), my first local in Prague was U Pětníka, a small pub near the Dejvická metro station. I was introduced to it by a friend and it was love at first pint. The place is rather small, welcoming, with solid food and great atmosphere. They also had very good Staropramen 10º tanková. 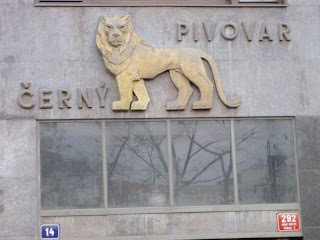 I spent many a great evening there, until InBev decided to turn the Smíchov brand into the Czech version of Brahma, which made me go in search of greener pastures. By that time my beer horizons were expanding and one day I came across Pivovarský Klub, which became my local after the first sip of I don't remember now which beer. At the time, this place was something unheard of, six taps! and all with stuff from small and micro breweries. I would go every week just to see what was new. I made friends there, got in "ahoj" terms with some of the staff and sometimes could spend hours chatting with them or the owner. What a great place, to this day, and it would still be my local if in April 2008 I hadn't found Zlý Časy. Today this pub in Nusle is almost an international celebrity. It was ranked by RateBeer among the Top 40 pubs in the world and it came out in first place in a recent survey carried out by a Czech newspaper. Things were very different three and a half years ago. The pub had just come out of its contract with Staropramen and Pilsner Urquell and were just getting into the "čtvrtá pípa" thing. They had Kácov and a couple more things, but not only I felt this was just the beginning of something good, but the atmosphere of this cellar reminded me a lot of U Pětníka's and made me realise how much I was missing a place like that. It didn't take much for Zlý Časy to become my new local. With time I've met many of the regulars and I know that whenever I drop by for a pint I will find someone to chat with. I also have to honour of always having a place at the štamgasty table and also to be counted among Hanz's friends. He's Zlý Časy's owner, a great guy who knows a thing or two about beer and loves and loves what he does, but above all, who wants to do things the best possible way. I've talked to him countless times about his plans, his ideas, I've even helped him find suppliers for some of the imported beers, always sitting in that deep cellar, beer in hand. Since that first visit I've seen Zlý Časy grow to become what it is today, one of the finest pubs in the world, but at heart, it is still that same neighbourhood dive I fell in love with back then. This morning I saw on Evan Rail's Twitter feed, and if you aren't following him you should be, that global brewing beast ABInBev have bought the Budweiser Bier trademark from Budějovický měšťanský pivovar aka Samson. For years the three claimants to the "Budweiser" name have been engaged in a slugfest over the rights to that name in courts around the world. Sometimes the Czechs won and sometimes Anheuser-Busch came out on top. In the minds of most beer geeks though, there was only one "original Budweiser" and that was Budvar. Something of a strange choice for the "original Budweiser" given that they are 100 years younger than Samson and some 30 years younger than Anheuser-Busch. Generally though I am not one for getting my knickers in a twist over a business deal, but there is a great sense of disbelief that of all the multinationals to hook up with, they have chosen their erstwhile nemesis. Rationally speaking it is just a business deal, but rationality can go out of the window for this, though I am sure the shareholders of Samson are rationalising their decision with abandon. Having taken on the Goliath for donkeys years, one half of the David has decided to take the filthy lucre. So while you won't hear me banging the drum about "selling out", today I am sad that a brewery founded in 1795 and with roots that stretch back even further than that, has been swallowed up by a leviathan of the brewing world. "AB InBev and BMP (Budejovicky Mestansky Pivovar) have settled all their trademark disputes and AB InBev has acquired the rights to BMP's "Budweiser" trademarks." Apparently, contrary to some reports, InBev have not bought the brewery, simply the rights to use the trademark "Budweiser". I imagine then that as Budějovický měšťanský pivovar trade as Samson, we will see a re-branding of the beers currently bearing the "Budweiser" mark under the Samson brand. While I am saddened that they have sold the rights to the trademark, at the end of the day, regardless of the labelling, as long as the beer remains decent that is the important thing. Now, someone on February 1st, pass me a Budvar. Back in the winter of 2008 it would have been almost inconceivable that I would be capable of keeping a cellar of beers with the intent of aging them. I was an impulsive drinker, buying stuff and enjoying it within a week or so. Aware of this predilection for drinking beer, I bought a bottle of Orval while visiting my parents in France that Christmas, and squirrelled it away in a dark cool place to await my eventual return. Fast forward to the winter of 2011 and I again found myself in the French countryside visiting my parents. As you likely know, I stocked up on most of the beer for that trip by ordering a load from Beer Ritz for my parents to pick up at my eldest brother's place. However, on the first shopping trip of the holiday my mind was set on the beer aisle at the L'eclerc in La Souterraine. Sadly there was no Unibroue this time, but Orval was there, and only €1.60 a bottle (that's $2.03 or £1.32). The aim of my experiment was to drink a young version of Orval followed by an aged, from the same glass, suitably cleaned between drinkings of course. I wish I could share with you the pictures of I took, but circumstances have mitigated against me on that front, hence the old picture of Orval above. Suffice to say Mrs Velkyal and I are currently sans camera. Anyway, to the beers. 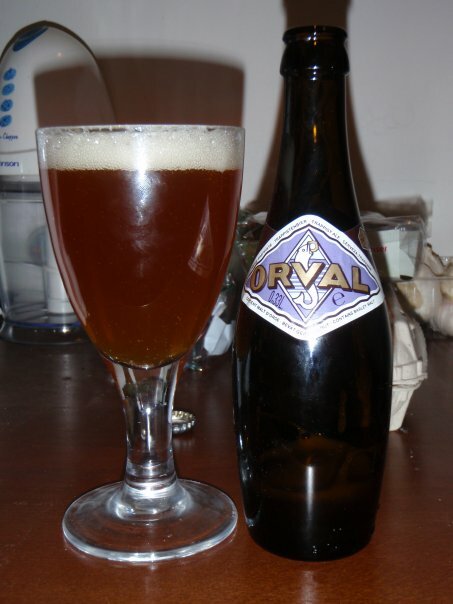 Young Orval was largely as I remembered it, pouring a deep slightly cloudy orange with a voluptuous white head. The nose was at first lemony followed by cupboards that haven't been dusted for some time, with a trace of old man pub. In the mélange of aromas I also picked up traces of spicy hops and a fruitiness that reminded me of apricots and peaches. In the drinking bit, which is in reality the best bit, the sweetness of the malt held up firmly against the bitter twang of the hops and the slight sour tinge that was flitting in and out. When I first drank Orval, I wasn't sure what to make of the bright, sparkling effervescence of the beer, now I really enjoyed it. A quick swirl of the bottle and in went the rest of the dregs, yum. Old Orval surprised me by being a slightly darker shade of orange, bordering on a light brown, and the head while voluminous, was rather less buxom that the young version. What a hit of sourness smacks you in the face when you smell this stuff, as well as some kirsch and the lemons of youth have become moldy. People often say it smells of barnyard and leather, I got more hay and cow shed (and yes, I have spent enough time in cow sheds to know how they smell). Rescuing my olfactory senses from the onslaught of tarts longing to abuse it, I took a mouthful. This stuff has zing, yes it is tart and sharp but it didn't remind me of vinegar in the slightest, in the background the same malt sweetness of youth lingered, but the sourness of age had come to the fore, making it very dry and puckering to drink. I bloody loved it. Come then with me to 2012 and yes I have a cellar of beers being aged for some illusive special occasion. I think some Orval had better join them, mind you at about $6 a bottle (three times the price in France) it won't be an awful lot. Tucked away on the Rue des Cannettes in Paris is a brewpub that goes by the name O'Neil. It is a place that I have been aware of pretty much ever since my parents moved to the Limousin area of France and going to visit entailed a couple of hours in Paris waiting for a train. The main reason Mrs V and I had never visited was because we were either waiting for said train early in the morning, or we only had a very short amount of time and needed to eat and drink somewhere close to Gare d'Austerlitz. As I mentioned last week though, just before Hogmanay we spent a couple of days in the city, with The Tale of the Ale author Reuben and his wife. Finally we had time, and it is never a bad thing to have exemplary company to go to a pub with. From the outside it kind of looks like many an ethnopub in the great cities of the world, dark wood, lights that are perhaps a tad garish, you know the kind of places, often they go by the name "The Dubliner", "The Rose and Crown" and so on. The first thing I noticed as we were being led to our table (never sure how I feel about that in a pub, but that's a different story) was the taps*. No fancy set ups, no labels telling drinkers what was coming out of each one, brass, chrome and wood, industrial, suggesting a confidence in their product. This was clearly a beer place, and beer places are my kind of places - I am starting to believe that the pub is a transnational institution. They had four beers available the night we visited, a Blanche, Blonde, Ambrée and Brune. Did I mention yet that the place was packed? Absolutely to the rafters packed and so in fear that there may be too long of a downtime between pints, Reuben and I ordered two pints each while the ladies had a bottle of wine. A quick side note, did you know that Virginia law stipulates that a person can only have 1 alcoholic beverage at a time? It was nice not having to think about such stupidity. I ordered the Blonde, described as a "Lager Ale", and the Brune, described as a "Stout". I was fairly sure that the Blonde would be something along the lines of a Kölsch and I wasn't disappointed. Clean, crisp and with a fruitiness that balanced the hop bite very nicely, it was just what the doctor ordered after strolling the streets of Paris in the rain. The Brune was nice too, not really a Stout as we would understand them, but then the style is less important than how good it tastes, and taste good it did. 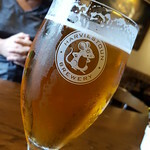 Admittedly I stuck with the Blonde from there on out, served as they were in hefty mugs that made a satisfying clunk as Reuben and I cheersed each fresh pint. Good company, good beer and a pub with a good atmosphere, what more could anyone want from a night out drinking? * For some pictures of the night and the taps, see Reuben's post. When I went to France in 2008 for Christmas and New Year, we actually spent Christmas in Kent at my eldest brother's house, I drank a fair bit of local Kentish ale. 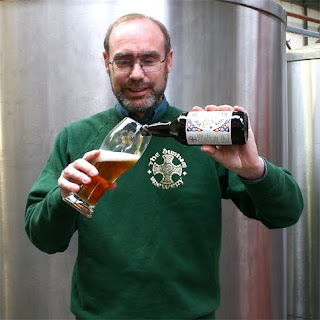 One of my January posts was about the Gadd's beers that I drank while I was there, and in the comments was a new commenter for me at the time, one Mark Dredge, author of Pencil and Spoon and subsequently much lauded beer blogger. It is my pleasure then, that today Mark is my guest blogger. I don’t have a local. Not somewhere I’d like to regularly drink that’s stumbling distance from my front door. I never have had a local. When I moved in with my girlfriend two years ago I went in search of a local and found nothing (I found pubs but not ones I’d like to drink in...). I’m moving house in a few weeks and I’ll go on the search for a local again then. I hope I find somewhere good, although I doubt I’ll go there very often. Not having a local doesn’t bother me much. I wasn’t brought up around the pub environment so it never mattered to me. More important was spending time with family and friends. For me, being with family or friends is more important than where we actually are. I very rarely go out drinking alone. I don’t pop to the pub for a few pints and a chat with whoever is there. I’d rather sit at home with a bottle from the fridge (though solo drinking can be a fine thing). There are pubs that I go to more often than others, so I guess these are my ‘locals’, even if they would take me over an hour to travel to from home. But I don’t work near where I live and I tend to go out near where I work. And that’s in London and London has a lot of pubs. I’m not a monogamous drinker. I regularly return to the same places but I go because I like the beer there or want to meet friends there. A local, for me, is something that other people have. Maybe if I lived near a good pub this would be different. Maybe not. Back in November I had a choice to make. My parents were going to be in England visiting my eldest brother, and they were taking their car, so I asked if they wouldn't mind taking a case of beer back to France for me. Naturally they were happy to do so, and so I ordered a selection from Beer Ritz. 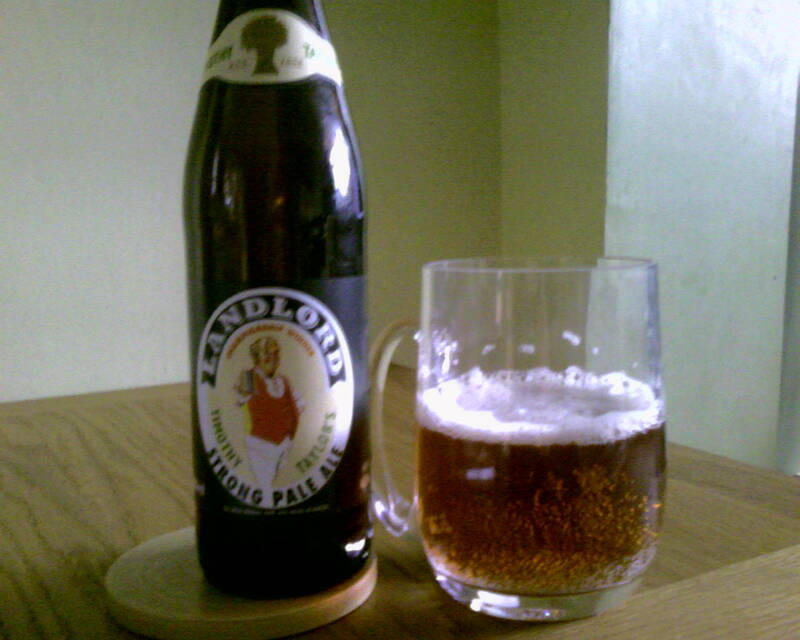 There was one beer which I absolutely knew I wanted in the selection, the magnificent Timothy Taylor Landlord. I had last devoured a bottle of this nectar in 2008 whilst at the same brother's house for Christmas, which was the last time the entire clan was together at the same time. Knowing that I loved it, I ordered 4 bottles so I could indulge to my heart's content. At 4.2% abv, Landlord is a beer you can sit with and drink a fair few of without keeling over when you stand up and discover your legs no longer function. I love the fact that the label describes it as a "Strong Pale Ale" and while I may quibble over the use of the word "Strong" there is no arguing that this is as packed with flavour as any, more feted or trendy, beer. I will not bore you with tasting notes, but rather simply say this, if there is a better Best Bitter in the world I am yet to drink it. Unfortunately I have never seen it in the US, but I will have a stab at brewing a clone version. I have read that the grist is simplicity itself, 100% Golden Promise, the hopping is a blend of Fuggles, Styrian Goldings and East Kent Goldings, and I have a packet of Wyeast West Yorkshire yeast in the fridge. I was planning my first brew of the year to be an 1868 Younger's XP (a Scottish IPA brewed with Saaz), but that might get bumped to the second brew of the year. Each of the 4 bottles I had in France went down with inordinate ease, hopefully my own version will do likewise. * again the picture is not from this trip, but there is a very good reason for this, honest. It was nearly 7pm when our little Dash 8 swooped into Charlottesville's little airport. It was Hogmanay, though for Reuben of Tale of the Ale fame it was already 2012. Mrs Velkyal and I had finally finished crossing the Atlantic, having spent 2 weeks in France, the last 2 days of which were spent in Paris with Reuben and his wife. I am not much of one for flying, or at least the taking off and landing bits, I don't mind the middle bit as long as there is an absence of turbulence. I also find that being 6'4" makes flying an exercise in feeling the pain of the sardine. From a beer point of view, France was something of a Curate's Egg. Much of the beer was distinctly meh, some entirely undrinkable, some reassuringly as good as usual and some a lot better than expected. If you have been following Fuggled for a few years, you may well recall that the last time I went to Paris was in January 2009, and that I was somewhat scathing about a British themed brewpub near Gare d'Austerlitz, The Frog and British Library. The beer was thin, the mouthfeel overwhelmingly watery and in the case of the stout, simply unfinishable, but the food was good. We found ourselves there again on Thursday night as, out of necessity, we were in the area and needed feeding. The food is still good, and happily the beer is much improved. The In Seine no longer left me wishing that was exactly where it was, indeed I had a second pint as I revelled in the flavours and aromas of Styrian Goldings - a hop that I like very much. The Dark de Triomphe actually got finished this time. I am not saying they are wonderful beers, but they are drinkable and repeatedly so. Thus on Friday, having walked from Notre Dame to the Eiffel Tower, via the Champs Elysee and my first ever hot beer (won't be doing that again, I am sure I can still feel the fur in my veins from the sugar), we jumped on the Metro to head for the original Frog brewpub, The Frog and Rosbif. Part of me wonders if having a British themed pub on Rue de Saint Denis is irony, coincidence or the 20th Century equivalent of hoisting your bow drawing fingers at the vanquished French? Whatever the truth may be, one thing is certain, Le Frog and Rosbif would be a regular haunt for me if I lived in Paris, simply because they have the In Seine on cask (or at least they did on our visit, maybe they rotate). Not only do they have it on cask, the waitress wasn't utterly baffled by me asking if it was sparkled (it was) and happy to give me an unsparkled pint so I could compare. I won't get into the ins and outs of the sparkler debate but I prefer sparkled beer and this test did nothing to challenge that. Discovering that the beer at the Frog brewpubs had improved was probably one of my beer highlights of the trip. I am one of those people who thinks that it is better for the beer industry as a whole for existing breweries to get better rather than go under; it keeps people in jobs for a start. Some might moan that the beer styles being brewing by The Frog guys are uninteresting. However, as I have said many, many times, if a brewer can't make a sub 4.5% abv beer that I want to drink several off, then I wonder to myself how good a brewer is he or she in reality? * The picture is from the 2009 trip, the In Seine I had last week was darker, so I guess they may have messed with the recipe as well.